Whenever anyone contacts me for advice concerning a RICO claim, they explain the facts and ask: “do I have a RICO claim?” My answer is inevitably: “yes, of course you have a RICO claim, but everyone living and breathing in the United States has a RICO claim.” Given the breadth of the mail and wire fraud statutes and given the extent to which technology invades all of our lives, it is not a stretch to say that we all have RICO claims at any given moment. With RICO, the question is not whether you have a claim, but whether you have a good claim. Some defendants are more troublesome than others. Increasingly, more and more people want to sue the government, be that federal, state, local, foreign, tribal – some form of government. At best, many of these latter cases involve a violation of due process rights, e.g., the victim did not receive notice or an opportunity for hearing, but it is not a crime (let alone racketeering activity) for the government to deny an individual due process. Moreover, government entities cannot be defendants under RICO. A corrupt government agent can individually be named as a RICO defendant, but these wars are very difficult wars to wage, expensive and time consuming. A RICO claim cannot exist in the absence of criminal activity. The simplest way to put this concept is: no crime – no RICO violation, and by crime I mean one of those crimes listed in section 1961(1). RICO addresses long-term, not one-shot, criminal activity. Not only must a RICO claim be based upon criminal activity, but the criminal acts must constitute a “pattern” of criminal activity. A single criminal act, short-term criminal conduct, or criminal actions that bear no relationship to each other will not give rise to a RICO claim. New claims are better than old claims. The United States Supreme Court has imposed a four-year statute of limitations on all civil RICO claims. Civil RICO’s statute of limitations begins to run when the victim discovers or reasonably should have discovered its injury. 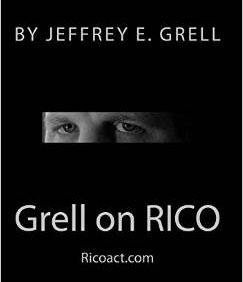 RICO is like any other law – the victim must pursue its right to relief with diligence. If one can avoid a statute of limitations defense, one should. In short, under the right circumstances, RICO can be an effective tool, but RICO is not right for all circumstances.